In a 2013 article in the McKinsey Quarterly, entitled ‘Making time management the organization’s priority‘, authors Frankki Bevins and Aaron De Smet surveyed 1500 executive leaders around the globe, and found that only 9% considered themselves ‘very satisfied’ with their time management. Of those who deemed themselves effective time managers, 85 percent reported that they received strong support in scheduling and allocating time. Only 7 percent of ineffective time allocators said the same. This is a remarkable insight – particularly when you consider how much time is wasted company-wide in the scheduling of meetings (we’ll address this is an subsequent posting). This may seem obvious to you, but managers need to get a grip! Are you an effective time manager? If so, what’s your technique? If not, what are you wasting time on? Sign up for MeetOMatic Pro! 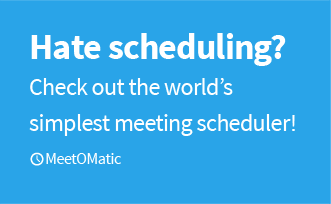 MeetOMatic is the World's Simplest Meeting Scheduler! It has been around since 1998, and continues to provide the quickest way to schedule meetings, appointments and interviews. Visit www.meetomatic.com to schedule your own meeting! Follow us on Twitter and LinkedIn for the latest updates and tips!